Woman's Firstep Wish List - Firstep - OKC Metro Alliance Inc. In response to requests from our generous community, OKC Metro Alliance, Inc. and its Women’s FIRSTEP program have assembled the below listed items for a wish list. These are items our program needs to help support our mission and further extend our outreach. Please contact us if you would like to donate anything you see here. The list will change periodically so if you don’t see something now, please check with us from time to time. We appreciate all the love and support from our donors and take pride in the partnerships we establish through your willingness to give. OKC Metro Alliance, Inc. is a not for profit 501(c)3 corporation. All donations are tax deductible. Please contact the Women’s FIRSTEP program directly at 405-794-2834 or call our corporate office at 405-232-1864. 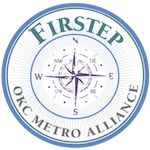 You may also email our Women’s FIRSTEP Clinical Coordinator, Christina Koch, at c.koch@okcmetroalliance.com.